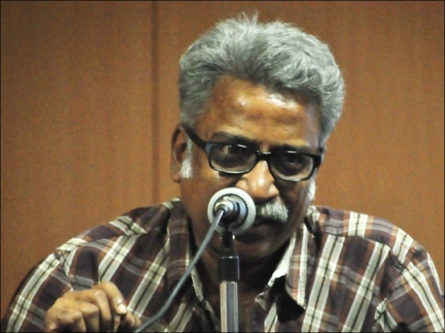 At the time of his demise, Pandian was a Professor of History at JNU, New Delhi, where he was employed from 2009. He did his BA in Naakarkoayil (Nagercoil) in 1978 and his MA and PhD from Madras University in 1980 and 1987 respectively. He was also a Commonwealth PostDoc Fellow at SOAS, London in 1991-92. His hugely influential book “Brahmin and Non-Brahmin: Genealogies of the Tamil Political Present” is considered a must read for anyone interested in Dravidian politics of Tamil Nadu. He has published several academic articles on Tamil politics, nationalism, history and historiography, caste, culture, and film criticism. Sources say that selections of his articles are to be published as a book soon. He is one of the rare few Tamil Nadu scholars who have effectively presented the accomplishments of Periyar’s politics in the academia. While the mainstream Indian scholarship in general tends to denigrate or downplay the achievements of Periyar, Pandian had effectively challenged this intellectual hegemony and provided a robust intellectual defence for Periyar’s thoughts and politics. A long-standing supporter of the Tamil Eelam struggle, he vehemently condemned the deployment of the IPKF in 1987. Sources close to him say that he also participated in several public demonstrations against the same. Likewise, during his stay in London in his PostDoc tenure, he developed a friendly rapport with Col. Kittu. Following the massive student uprising in Tamil Nadu in early 2013 opposed to the pro-LLRC US resolution and supporting Tamil Eelam, he had co-authored with Mr. A. Kalaiarasan, a JNU PhD student and activist from Tamil Nadu, a widely circulated article called “A Tamil Spring?” Published in the EPW on the 13 April 2013 issue, it was optimistic about the possibility of a new political future in Tamil Nadu. 09.04.13 ‘TN student movement opens possibilities of new political fu..